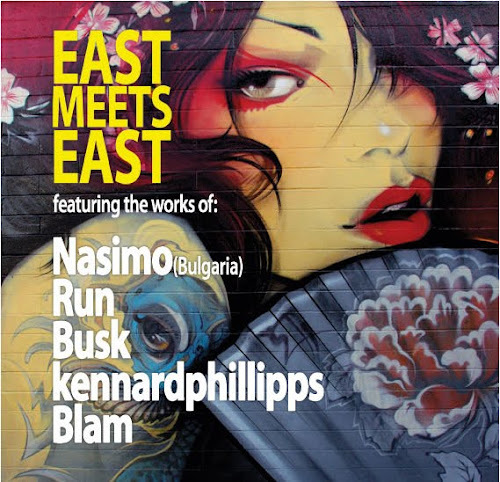 One for the diary next week March 4th, a brand new gallery space and a new exhibition entitled "East Meets East", featuring works from Nasimo (Bulgaria), Run (London), Busk (London) and kennardphillipps (London). In keeping with East London's traditionally renegade spirit, and made relevant by the development of one of the most deprived urban areas in Europe in the name of the Olympic movement, the exhibition will ask the audience to consider the part played by artists in the process of urban regeneration and renewal. Forman's Smokehouse Gallery is a brand new art project space overlooking the London 2012 Olympic Park and was founded to provide artists with a high profile platform from which to introduce their work to new audiences. With spectacular exhibition space measuring more than 600 square metres (6600 sq ft) and with an unrivalled view of the new Olympic stadium, the gallery is situated on the top floor of the UK's oldest salmon smokers, H Forman & Son, which was forced to relocate to its new site by the Olympic development. Hackney Wick and Fish Island have the highest concentration of artists studios in the world.